If you want to ensure that your home roofing system remains in good condition year-round, then it is imperative that seasonal care is on the top of your to-do list. Therefore, you must make sure that summertime roof cleaning is something that you partake in. If you want to avoid costly repairs and other inconveniences, then cleaning your roof during the summer is a must. Here are a few things you should know and do when it comes to summertime roof cleaning. Make sure that you choose a non-windy, sunny day to clean your roof. Obviously, you won’t want it to be too hot when you get up on your roof, so choose a day that has temperatures in the low to mid-70s. You may also want to try to clean your roof earlier in the day to avoid excess heat and UV rays—who wants an unnecessary sunburn? The most important thing is that you choose a day that is not windy—to avoid having any chemicals that you use being blown off the roof—and a day that is not rainy. Once you choose a good day to clean your roof, you will want to make sure that you practice proper safety precautions. Ensure you wear adequate footwear, such as anti-slip boots. In addition, don’t go up on the roof without somewhere being around or at the very least knowing that you will be getting on the roof. The best thing you can do is to have someone on the ground in the event that you need them. You never know when you may need them to throw or hand something up to you—it sure beats you having to go up and down the ladder. Over time, a significant amount of debris will accumulate on the roof, some of which won’t come off of the roof easily. This debris will trap moisture on the roof, creating the ideal environment for mildew, algae, and moss. 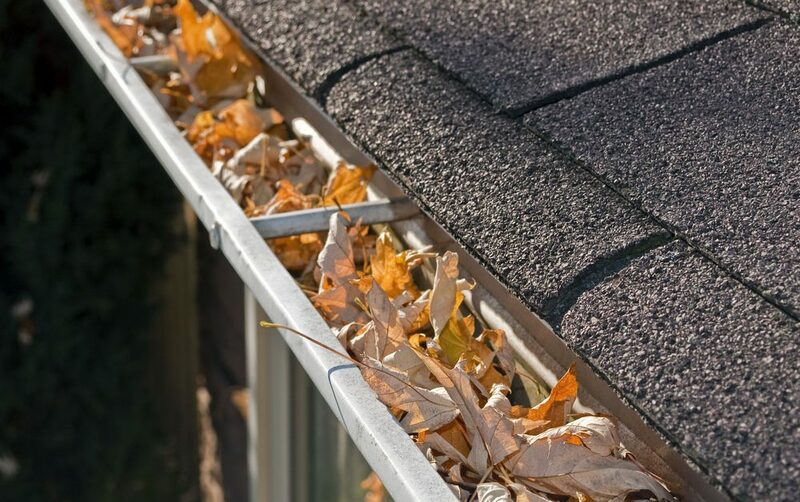 This debris needs to be thoroughly removed, including leaves and pine needles—all of which could potentially creates major clogs in your gutter system and result in ice dams once winter comes along in a few months. Just because you are cleaning your roof doesn’t mean that you shouldn’t clean your gutter system while you are at it; in fact, this should be part of your summertime roof cleaning routine. After all, the gutters are part of your roofing system. Your gutters should be cleaned out thoroughly at least once a year, though they should be cleaned out more if you can find the time to ensure they are functioning properly year-round. This will help to reduce the need for costly roof repairs. When you perform summertime roof cleaning, or a roof cleaning any time of the year, make sure that you also perform a visual inspection of the roof so that you can spot any signs of damage. Harsh winters and spring storms can often result in serious damage on your shingles, and early detection of this damage is key to avoiding further damage and unnecessary costly repairs. Look for any signs of wear and tear, such as degranulation in the shingles, curling shingles, missing shingles, or even any areas that may be developing leaks—all of which point to the need for professional repair. If you need help cleaning your roof during the summer or spot any signs of damage, contact the experts at Bullard Roofing for professional roofing assistance.